Step 3. Open your browser to http://localhost:8000 and have fun! Each ticket costs 0.1 ether, or roughly $0.15. 6800 blocks, or roughly 1 day. This is just an experiment, so 0%. That means that (except for gas cost) the expected value of playing EtherPot is 1. 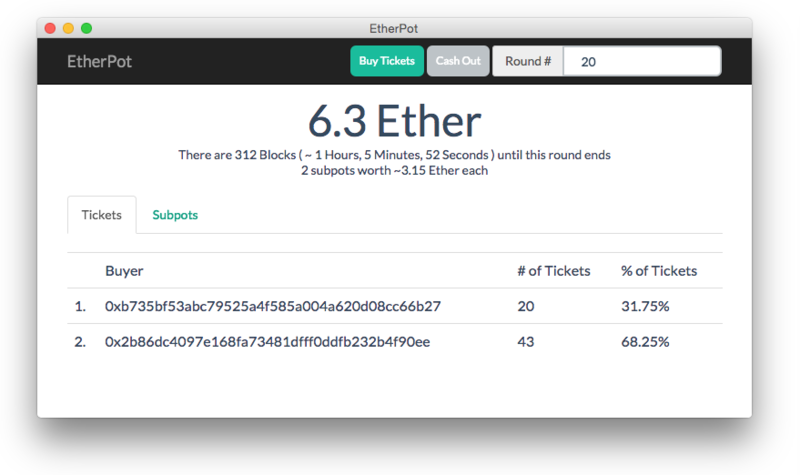 EtherPot uses the blockhash of the blocks immediately after the round ends to determine the winner. How do you keep the miners from cheating? Each pot is split into subpots of 5 ether. Because the value of each subpot is less than the block reward, there is no incentive to cheat. EtherPot is an autonomous contract and has no owner. This website is managed by @aakilfernandes.